A step-by-step guide to managing the monster sibling of grief. I read this article and found it very interesting, thought it might be something for you. The article is called 10 Ways to Overcome Grief-Related Anxiety and is located at http://modernloss.com/10-ways-to-overcome-grief-related-anxiety/. Anxiety following loss is a very real, yet often overlooked symptom. It seems to come out of nowhere and most people attribute it to factors other than their grief. I went through my own bouts with anxiety following the loss of my parents – panic attacks, hypochondria, and a general sense of pervasive dread. It took me a long time to connect the dots to my grief. I did so only after becoming a therapist and seeing so many of my clients experience the same symptoms. It makes sense that loss causes anxiety. Losing someone we love thrusts us into a deeply vulnerable position. We experience a range of emotions unlike anything before. We are fiercely reminded of our mortality and the precariousness of life in general. We fear more loss and more unexpected events. We also live in a culture that isn’t great at supporting grief. All of these in combination make the perfect recipe for anxiety. Here’s a list of steps (adapted from my new book Anxiety: The Missing Stage of Grief so you can better work through your grief and begin to get a handle on your anxiety. 1. Learn a little about how anxiety works. Anxiety is the mind’s response to a fearful situation. Death and loss automatically sets off our fear-responders, putting you on alert and heightening physical sensations. Reminding yourself that this is a normal reaction and that it is our body’s way of managing stress can help keep you calm. 2. Check in with your grief. 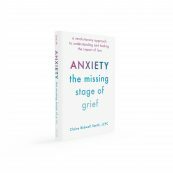 One reason we develop anxiety after a loss is due to unprocessed grief. Take some time to check in with yourself about your grief process. Are there emotions or memories that you are avoiding out of fear or pain? If so, open yourself up to doing some work in these areas (on your own or with the support of a professional) and doing so will be sure to ease the pressure on your accompanying anxiety. 3. Make amends. One of the reasons we get stuck in our grief and anxiety is because there is something left unsaid, or something we feel guilty about following a loss. Finding ways to ease your guilt and even make amends with your lost loved one can help with that pervasive sense of unease that comes with anxiety. It’s never too late to seek forgiveness, even after someone is gone. 4. Embrace resilience. Find ways to begin moving forward and healing. Sometimes we resist doing this because it feels like if we choose to move forward then it means we are letting go of our loved one. We will never get over the loss of a loved one but we can find ways to build a meaningful life in their absence. 5. Write your way through. There is serious power in writing through your grief. Writing helps us explore our own process, release tension, and connect with our lost loved ones. Put a pen to paper to quell some of that anxiety. 6. Understand how your brain works. Cognitive behavioral therapy is an intrinsic part of getting a handle on grief-related anxiety. Understanding how our thoughts work, and learning new methods to quell pervasive, repetitive and catastrophic thoughts is key to managing your anxiety. 7. The power of meditation. Meditation may sound like a soft approach, but it’s one of the more surefire ways to combat anxiety. Freeing yourself from pervasive thoughts and immersing yourself in the present moment can work wonders on the anxious mind. 8. Explore your connection to your loved one. This one is integral to healthy grieving and helps quash anxiety in return. Finding ways to develop an internal or spiritual relationship with your loved one will serve to bring you a greater sense of peace and compassion for your experience. Open up to the idea that your relationship is not over. 9. Get your affairs in order. Facing our own mortality and putting a few things in place for our own eventual deaths will help us feel less anxious about the inevitable. Ask yourself, if you were on your deathbed right now what would you want to take care of before you go? 10. Don’t go it alone. Grieving is lonely business, but it doesn’t have to be. One of the reasons we get so anxious is because we don’t know how we’re supposed to do this. Reach out and find some support, either in a grief group, one-on-one therapy or with a friend who understands. 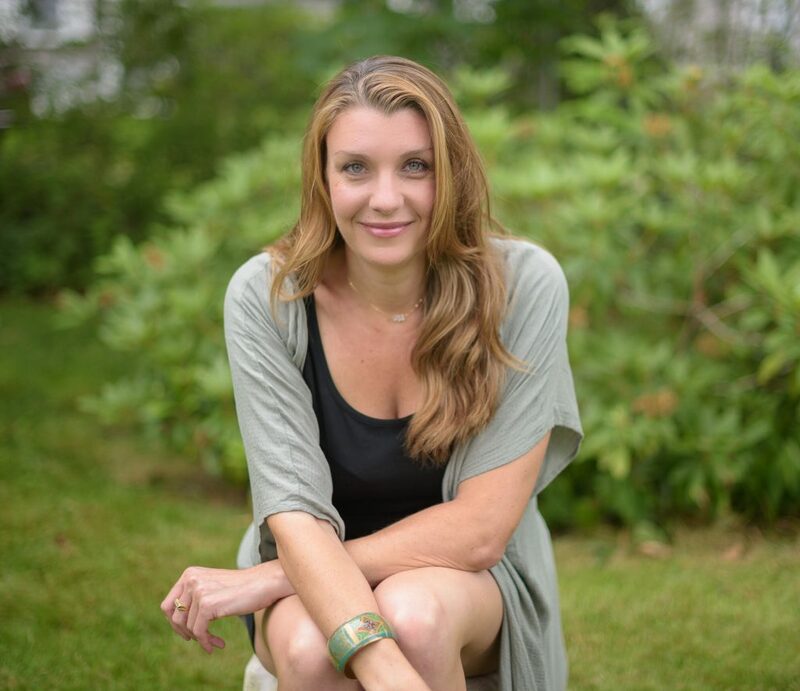 Claire Bidwell Smith is a Los Angeles-based author and therapist. 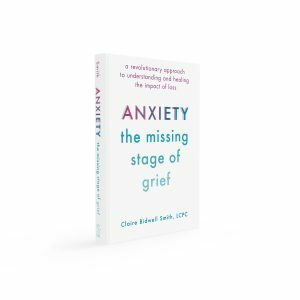 Anxiety: The Missing Stage of Grief is her third book about grief and loss.